Redding, California is an unusual location for a bridge designed by the famous architect/engineer Santiago Calatrava. Normally, only the richest cities can afford a work by this visionary artist. However, a group of the city's supporters were able to provide sufficient funding to ensure that the Sundial Bridge was eventually built (in 2004). Much of the engineering was done by the engineers hired to oversee its construction. Moreover, there was no agreement with the contractor over the price. It was a 'force' contract, where money was provided until the bridge was built. The cost eventually rose to over 23 million dollars or $1400 per square foot for the 700' long by 23' wide bridge (pedestrian bridges typically cost about $200 per square foot). 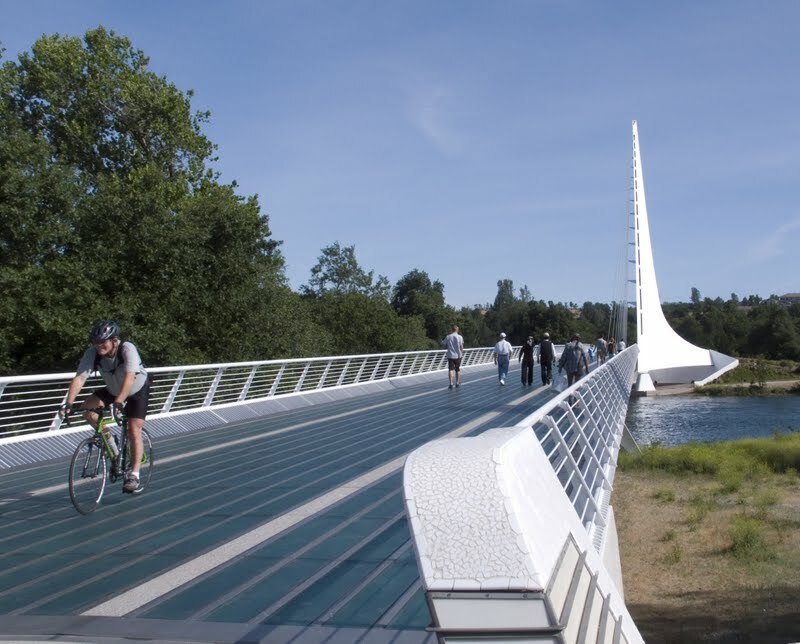 However, the Sundial Bridge has lured millions of visitors to the little nature center at Turtle Bay. It is an unusual cable-stayed bridge with a single tower supporting the superstructure from one end of the bridge. The bridge deck is made of glass panels that turned out to be easily broken when items were dropped onto it. On a sunny day, the shadow cast by the 217' tower moves a foot a minute across the dial constructed on the north side of the Sacramento River. Cable-Stayed Bridges: The Sundial Bridge by Mark Yashinsky is licensed under a Creative Commons Attribution 3.0 United States License.